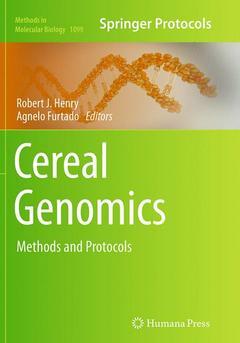 In Cereal Genomics: Methods and Protocols, expert researchers provides modern protocols for the analysis and manipulation of cereal genomes. Techniques for isolation and analysis of DNA and RNA from both the vegetative tissues and from the more challenging seeds of cereals are described. Tools for the isolation, characterization and functional analysis of cereal genes and their transcripts are detailed. Methods for molecular screening of cereals and for their genetic transformation are also covered. Written in the highly successful Methods in Molecular Biology series format, chapters include introductions to their respective topics, lists of the necessary materials and reagents, step-by-step, readily reproducible laboratory protocols, and tips on troubleshooting and avoiding known pitfalls.